It is that time again. The moment when we have the privilege of sharing our upcoming accelerator cohort with the world. 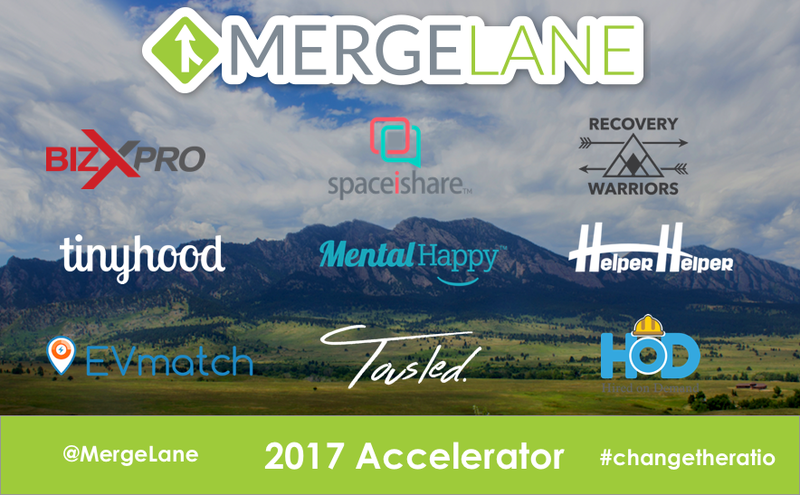 We are happy to announce the third MergeLane Accelerator class that will begin on February 12th. We are thrilled to add these exemplary nine companies with at least one female in leadership to our program and portfolio. EVmatch (Santa Barbara, CA): A distributed network (a la Airbnb) for charging systems for electric vehicles. Individuals can make outside charging stations available and rentable during their off hours. BizXPro (Toronto, ON): A marketplace to find and hire IT resources on a contract basis. Upwork for IT resources to save companies from having to have an in-house FTE team for this limited and highly specific need. MentalHappy (Las Vegas moving to Denver/Boulder, CO): An e-commerce “box” company that sells “cheer boxes” to send to those in your world who are grieving or in pain. Helper Helper (St. Louis, MO): A SaaS platform for high schools and colleges to track student athlete volunteer hours. Tousled (Seattle, WA): A service platform to allow consumers and businesses to book beauty and massage professionals for on-location services. Hired on Demand (Denver, CO): A marketplace for construction companies and commercial developers to staff commercial construction projects with available, vetted subcontractors on demand. Tinyhood (Boston, MA): An on-call expert Q&A service for parents to get quick answers to urgent questions about kid-related questions 24/7. RecoveryWarriors (Denver, CO): A digital content platform, community (300k users strong), and eventually app to boost the emotional intelligence and resilience of people struggling with depression, anxiety and eating disorders. SpaceiShare (Toronto, ON): A marketplace for peer-to-peer distribution of parking and storage spaces. MergeLane is focused on advancing the potential and growth of female-led companies. We do this through our accelerator (see our 2015 cohort and 2016 cohort), our investment fund (see our fund portfolio), and educational programs like Women’s Leadership Camp and Summer Leadership Camp for Girls. If you’d like to learn more, visit www.mergelane.com.